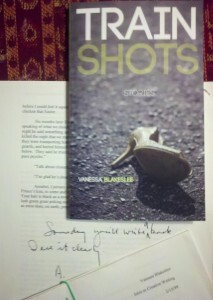 I met Vanessa Blakeslee in August 2012 at the Bread Loaf Writers’ Conference in Vermont. On the first day, we both stood studying the wall of attendee photos when Vanessa introduced herself and said she recognized my photo from my Poets & Writers articles, which I’m sure will go down in history as the first and last time anyone recognizes my photo in that way ever. In any case, it was one of those meetings that seemed to spark an instantaneous friendship. Before long I was admiring (and envying) Vanessa’s writing in workshop, and she became one of my best Bread Loaf buddies. I also came to know Vanessa as a hardworking and talented writer whose fiction, poetry, and reviews have been published widely. 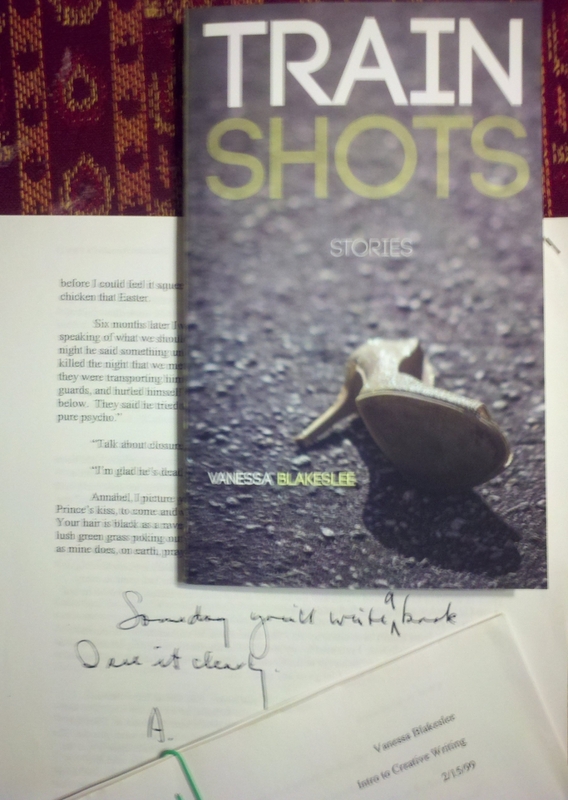 Now, I’m happy to announce that Vanessa’s debut short story collection, Train Shots, will be published in March by Burrow Press. I got my hands on an advance copy of this collection, which features Ask Jesus figurines, deadly train collisions, a troubled adolescent boy who threatens to slaughter a pet rabbit, a pop star’s downward spiral, and much more. I interviewed Vanessa to learn more about her writing journey, how this collection came to be, and the eerie catalyst that set the title story of her collection into motion. You recently shared a photo on Facebook that showed a former writing instructor predicting – back in 1999 – that you would one day publish a book. Can you fill us in on the story behind that message and how it ties into your writerly beginnings? How did you develop into the published author you are today? As a child I made up stories constantly—whether by play-acting with Thundercats action figures or sitting down at my mom’s electric typewriter until I used up all the ribbon. But by high school and my first year of college, I had largely set aside my own imaginative writings. My sophomore year I studied abroad in Australia, and I can only describe my time there as a spiritual awakening of sorts, the kind born from travel and spending time intensely with a congenial group of very different people. When I came back, I enrolled in my first creative writing workshop and within the first few classes, knew that this would be my path. The comment on that early story draft I recently posted was from Phil Deaver, my first writing instructor, and I can remember stepping out of class, reading those words and the affirmation they gave me about where my talents and sensibilities remained. I must have saved his remarks for a rainy day when I needed encouragement, although of course that old story draft had long since been forgotten, until I cleaned out some files recently. Taking that photo of those prophetic words next to the ARC of my book was one of the most surreal and quietly powerful moments ever—proof that against all odds, you have the power to realize your wildest dreams. Success is a matter of focus and action. I also think it’s crucial to mark those moments of affirmation on your journey. Because the road is a long one, and not for the faint of heart, though you don’t realize this when you’re young, and it’s perhaps better that you don’t. Celebrate your successes, even those as brief as a remark on a job well done, for they have the potential to fuel you as an artist for a long time, months even. The most important thing, if you’ve got the talent and an attitude that’s open to growth and grunt work, is perseverance. In the collection’s title story, a train engineer is at the controls when his train strikes a young woman on the tracks. As someone who’s lived practically on top of train tracks for years, I found myself wondering about such train-related fatalities. What kind of research did you do for this story? Any train facts you can share with us? The impetus for “Train Shots” arose during a dinner conversation. A woman who was dating a train engineer mentioned how he’d been having a difficult time lately—apparently his train had struck several suicide victims within a couple of months. I became fascinated by this right away, and thought about how this was a conflict few people likely think about. My first attempts at telling the story fell flat, however. What follows is one of the strangest experiences that has ever happened to me. One afternoon I sat down to redraft the story. I had written the first paragraph or so, where P.T.’s train strikes the young woman, but then stopped, thinking to myself, “I have no idea what comes next, how the railroad companies handle suicides. I’ll have to do some research,” and so forth. It was about four o’clock; I had a package that I needed to send to the post office, so I decided to do that. Now the same tracks which run through Winter Park cut right across from the Maitland post office, up the road from my condo. I dropped off my package, and on the way home I noticed the train, a freight, had stopped in an unusual spot, right behind the library. Police cars parked alongside. A chill gripped my stomach and I slowed the car. It couldn’t be, I thought. But I found myself pulling over. In an eerie, dream-like daze, I walked up to the front of the train where a railroad employee stood. I asked what had happened, if someone had been hit. And he said yes, a young man from the neighborhood, apparently going through a rough patch in his life, had committed suicide not forty-five minutes before. And then the railroad worker, with hardly any prompting, proceeded to explain to me exactly what happens when a person commits suicide on the tracks—how the engineer slams on the emergency brake, and issues an immediate statewide alert. He told me everything I needed to know to write the story. In disbelief, I wandered to my car, past the yellow tape and the tarp covering the spot where the body had lain, went home and finished the scene. Your story “Princess of Pop” is a powerful ride. Most readers will quickly spot the similarities between your protagonist and Britney Spears. How closely do their lives intersect? How did you balance this Spears near-mirror image while also creating a sympathetic fictional character with her own inner life? Thank you. I’m so glad you found the story moving and powerful—“Princess of Pop” remains a personal favorite. The inspiration for this story occurred a few years back, when the tabloids chronicled every step of Britney’s meltdown. Waiting in the checkout line, I found myself lured to her eyes staring back at the camera. I felt haunted by her pain and desperation. So the story is rooted in what I can recall of her breakdown—a throng of fans and media surrounding an ambulance bringing her to the hospital, her dysfunctional family situation, and I believe in one of her music videos, she’s singing in a bathtub. But since this is a fictional account, I thought it would be fitting to play on the final days of another tragic singer, Janis Joplin, by having the “Princess of Pop” hole herself up at the hotel where Joplin died. And of course all the small, idiosyncratic details are invented: the designer bag, the olives, vodka and hair dye. From there I knew the conflict and themes I wanted to explore—the reading theme with her discovering A Confederacy of Dunces, and the question of authentic, lasting art vs. pop fluff. That’s where her inner life really turns into fiction—her character’s crisis over the phoniness imbued in her image and the exploitation of that, as well as having utterly lost touch with her authentic self. Have you ever encountered a figurine similar to the Ask Jesus figurine (which appears in the collection’s second story, “Ask Jesus”) in your own life? If so, we just might need a photo. The Magic 8-ball Jesus is an actual object which surfaced at a party late-night, and yes, inspired the story. But alas, it belonged to a former boyfriend of mine. If a photo exists of me with it, I’m willing to bet the shot is anything but flattering! From selecting the stories to securing publication, how did Train Shots come to be? I started many of these stories as an MFA student at Vermont College. In the years since, I kept revising them as they were accepted for publication in literary journals and along the way, kept sending out the manuscript to small press contests for book-length collections. Twice the full manuscript placed as a finalist, although under different titles—I kept playing with the stories to include, the order and the title. Just as I found myself exhausted of submitting it through the contest system, Ryan Rivas, the editor at Burrow Press, approached me about possibly launching my debut collection. At the time I was writing a craft blog for the Burrow Press Review, and he had come to know me as a hard worker and an active member of the literary scene, and he knew I’d been publishing in well-regarded places. He read the manuscript in January 2013, and afterwards contacted me with a firm offer. For the next several months, we went back and forth deciding which stories to swap out and which to include. This is your first published book. How would you describe the publication process? What was your experience of working with a small press like Burrow Press? Did you encounter any surprises along the way? Ryan’s philosophy is that assembling a story collection is a lot like putting together a music album, and he’s absolutely right – we left out certain stories not because they lacked merit, but because the ones chosen must speak to each other in a particular, resonating way. I’d describe the process as very hands-on; I absolutely loved the thorough scrutiny we both brought to the manuscript as a team. On my own, I’d never been able to come up with a satisfying order, and Ryan had a terrific eye—and ear, I might add—for which stories belonged where, a vision of the book as a living, breathing whole. Whereas I’d worked on the stories for so long on my own, I think I’d become too close to them. So I’d say I was ultimately surprised and thrilled by the finalized “playlist,” not to mention profoundly grateful. I was also surprised by how heavily we edited, and even revised in some cases, certain stories. All of them had been published before, and it’s easy for emerging writers, I think, to assume that once a journal has published a story, there’s no more work to be done. Far from the case. This is the stage where you have the opportunity to refine and bring your work to the next level, so you’re really presenting your best—to zero-in on repeated diction and unwieldy syntax, to make sure the final notes of each story truly sing. We had a deadline, of course, but we took our time. I believe our efforts paid off. Train Shots has a striking cover. Can you share a bit about the cover design process and how much input you were provided? The cover has grown on me—I wasn’t sure about the shoe at first. The funny thing is, I’m fairly outspoken about how I abhor the cover designs of so many books the big houses market as “women’s fiction.” Not that I would ever expect a small press publisher of literary fiction to slap a headless woman in high heels on the cover of my short story collection, but still. 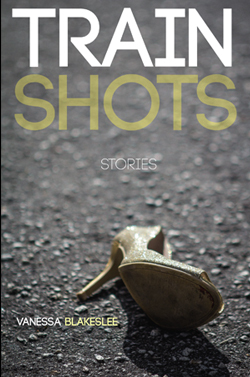 When Ryan broached the topic of the cover to me, we both agreed that the artwork should probably capture the title story, and one of the most striking images from “Train Shots” is the young woman’s mangled dress shoe at the beginning. Then Ryan had the additional idea of the toy cow for the back cover, as a symbol of P.T.’s shattered childhood dreams as well as the animals that fall victim to the tracks. 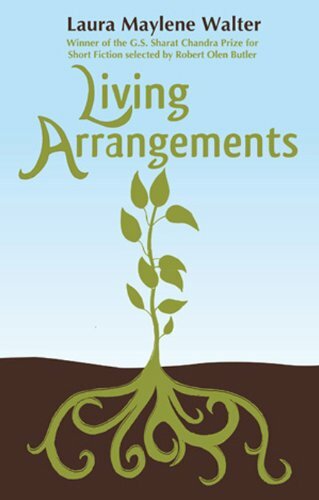 When I shared the cover design, people reacted so positively that any lingering doubts I might have had simply fell away. And now I think it’s kind of a snarky twist on the high-heel-as-ubiquitous-cover-shot-for-female-authored-books. It’s a sharp, smart design that perfectly captures the collection’s tragedy and dark humor. What’s next for you – what are you working on now, and what’s on the horizon for your writing career? For the past several months, I’ve been revising stories for a second collection. Lately I’ve been drawn to speculative and dystopian fiction, so I wouldn’t be surprised if I end up writing some new stories or even a novel in that vein. My agent is currently shopping my first novel, so with luck that will get picked up soon. In between I’ve been working on essays and book reviews. Finally, since we met at Bread Loaf in 2012, can you share something – an enduring image, writing lesson, or even dance move – you recall from that conference? You, me, and Grant squeezed together on the couch in the Inn lobby, watching the Honey Badger video on YouTube after a few beers at the Barn, and laughing maniacally. Great memory! Thanks to Vanessa for participating in this interview! Train Shots will be released March 4 and is available for pre-order via the Burrow Press site. Thank you both for such great answers to good questions. Thanks, Sarah! And I’m only just realizing how far away March seems…I can’t wait until Vanessa’s book is out for the world to see. Great interview. Will look out for the book. And that Jesus eight ball – all I can say is Christmas is coming. Totally agree on the Christmas present idea! Love the interview, Laura. And congratulations to Vanessa! 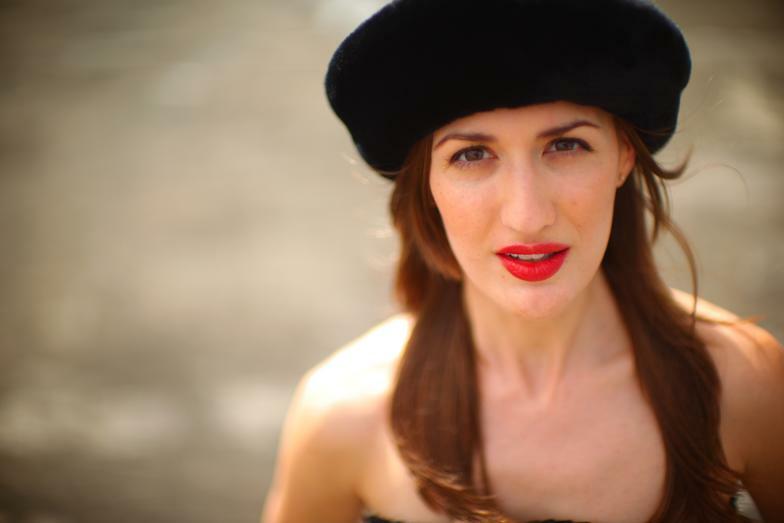 Great interview – I always love reading how short story collections come together. I’ll be ordering this one. Thank you!